I assist individuals to adjust to the transitions that are occurring in their lives as a result of separation or divorce. I help them to separate the emotional from the business part of the divorce so they can get through the days and deal more effectively with the emotional fall out. Coaching is not therapy. As your divorce coach, I do not offer legal advice or serve as a substitute for your attorney. Learn effective communication and negotiating skills. Learn to establish boundaries when interacting with your partner. Restructure your life in order to deal with the changes in your family obligations, parenting responsibilities, career plans, and social life. Have access to pertinent resources and referrals to lawyers, therapists, mediators, and financial specialists, who will give you information and support for your particular areas of need. Set and achieve both short term and long term goals. Step 2 – the nuts and bolts — how to get from where you are to where you want to be. This service is available in person or over the telephone and is not affected by geographic location. Please contact me if you’re interested in setting up a consultation. 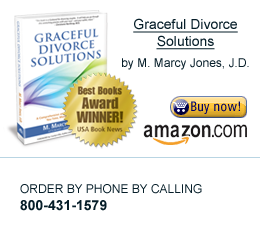 Please see my Family and Divorce Law Services site at MMarcyJones.com for information about my legal practice.